We are surrounded by through thought products and clever designs. Each day we use self-evident things that actually aren’t that self-evident. Because behind each article is a long history. Numerous designs and ideas are discarded, technical workouts take place and prototypes are constructed before the finished product comes into the world. The customer doesn’t know this in most of the cases. Thereby a glimpse on the appearance of a product emphasizes how much the designers and manufacturers work for it. Also for something as simple and common as cutlery. 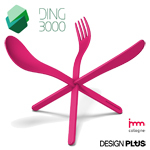 The Hanoverian designers from Ding3000 have been accompanied during the creation of their Join Cutlery. From the first ideas and designs over the cooperation with the manufacturer Konstantin Slawinski and the BASF Design factory and to the finished cutlery out of plastic – on the designers’ homepage, the fascinating creation of the multiple awarded Join cutlery can be followed with visual and textual descriptions. As a result of the long development, Join became cutlery and puzzle in one. With the fascinating joining mechanism, knives, forks and spoons can be joined. The disentangling of the cutlery puzzle makes the waiting time until the meal is served a bit shorter. Furthermore, with the used High-Tech-Plastic Ultramid® from BASF, Join is a serius cutlery set that can also cut meat.